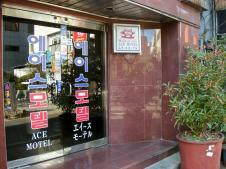 Ace Motel is the motel with clean facilities and convenient location despite its reasonable price. There are 28 rooms with a selection of bed/ondol room, twin room and bed room. Bed/ondol rooms are able to accommodate more than 2 people and suitable for group travelers. Yondusan Park, Jagalchi Market, PIFF street where Busan International Movie Festival is held, Department Store, many shopping streets, they are all located within 5 min. walk from the hotel. Please visit Ace Motel when traveling Busan.